Edna Hunsperger Bowman: registered nurse, mentor and avid volunteer; born 26 September 1912 on a farm near Cambridge, Ontario, Canada, the youngest of Dillman and Lydia (Nahrgang) Hunsperger's three children. The family attended Wanner Mennonite Church where Edna was baptized in her youth. Edna died 17 July 2002 in Cambridge, Ontario. At age ten, Edna's interest in nursing was kindled by a newspaper graduation picture of a nursing class clad in sparkling white uniforms and carrying bouquets of flowers. From that time on, with her mother's encouragement, Edna resourcefully worked toward a career in nursing. She graduated as a registered nurse from Kitchener-Waterloo Hospital School of Nursing in 1937. Until 1941 she worked as a nurse in Ontario, but then considered what she, as a conscientious objector, could do during World War II. That same year, an invitation came from Mennonite Central Committee (MCC) to serve as a nurse in England. Edna accepted and she and Elfrieda Klassen were the first MCC nurses to serve overseas. Edna and Elfrieda Klassen (who later married Peter Dyck of MCC) arrived in wartime London in 1942. Edna worked in large country residences with both children and the aged, evacuees from the bombings of the large cities. Eventually, she was assigned a post as matron of Shepherd's Hill Centre in north London. Here, Edna experienced air raid shelters, food rationing and the delightful wit of the English. Upon her return to Canada in 1946, Edna enrolled at Goshen College. In 1949, after earning a BA degree, she took a position with the Victorian Order of Nurses in Kitchener-Waterloo. Here she saw patients in their home settings. During this time, she was able to live with her aged mother. She mentored many student nurses in their placements with the V.O.N. and through the Mennonite Nurses Association and the Intervarsity Nurses Christian Fellowship. In 1957 Edna married Henry Bowman and they spent twenty-five happy years in the home Henry had built high on the banks of the Grand River in Cambridge. Both Edna and Henry were avid gardeners and bird-watchers. When Henry's health failed, they moved to Fairview Mennonite Home and apartments. Edna served the church and community faithfully in many capacities. She taught Sunday School and Summer Bible School, sponsored a girls' club, was a leader in WMSC and the Friendship Circle, volunteered for MCC and the Y.W.C.A. and served as a local councilor for the Waterloo Historical Society. Edna had a special love of history as it is portrayed in human interest stories. She could pick out the humour in the ordinary events of life and make them seem fascinating. She used her story-telling and writing gifts to advantage in well-researched historical skits and biographical sketches of other seniors. These serve as resources to writers and historians. Edna's life was one of willing service, and an encouragement to those who follow her. England Notes. Akron, PA: Mennonite Central Committee. Vol. 1 (1944-1945): 3-5 in July 1944; 4 in Dec. 1944. Marr, M. Lucille. The Transforming Power of a Century: Mennonite Central Committee and its Evolution in Ontario. Kitchener, ON: Pandora Press; co-published by Herald Press, 2003: 56-59, 61, 99. Shantz, Marcus. “Edna Hunsperger Bowman.” Ontario Mennonite History. Vol. 13 (September 1995): 17-19. Cressman, Miriam. "Bowman, Edna Hunsperger (1912-2002)." Global Anabaptist Mennonite Encyclopedia Online. December 2004. Web. 18 Apr 2019. http://gameo.org/index.php?title=Bowman,_Edna_Hunsperger_(1912-2002)&oldid=122449. Cressman, Miriam. (December 2004). 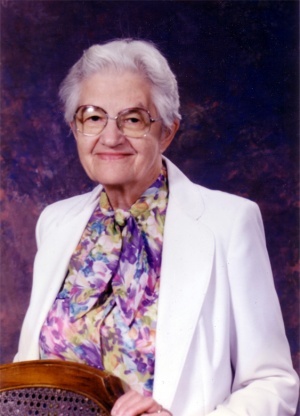 Bowman, Edna Hunsperger (1912-2002). Global Anabaptist Mennonite Encyclopedia Online. Retrieved 18 April 2019, from http://gameo.org/index.php?title=Bowman,_Edna_Hunsperger_(1912-2002)&oldid=122449. This page was last modified on 23 May 2014, at 18:49.